Hello Scrapping Cottage friends! Thanks for taking the time to stop and visit today. It's Mary Marsh here bringing you the Friday edition of the Blog. We are still having crazy hot and humid weather here in the Eastern part of the U.S. So thinking about snow, ice and Christmas right now seems strange especially when I am harvesting lots of tomatoes, zucchini, basil and peppers (lol)!!! But, the Christmas dies are in the online store and I know you all are looking for ideas and ways to use those dies. So here I am with some inspiration using the Woodland Mailbox die set. 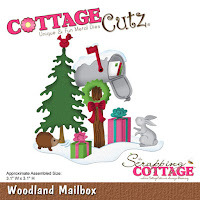 This set comes with the mailbox, pine tree, wreath, presents, bunny, hedgehog, bird, snowbank and even letters for the mailbox. It is a super cute set. You could die cut with white cardstock and then color the images the way you want. Or you could do as I did and die cut with different colored cardstock. It's your preference and either way it would make for a cute card. I like to make Christmas cards using non-traditional colors as well. On this one I used a soft pink, a soft blue and a wasabi shade of green. So let's get started with some details on how I created this card. Wasabi Green card base: 5 1/2" x 4 1/4"
White image panel: 5 1/8" x 3 7/8"
I started this card by sponging my background panel with a soft sky blue and a soft pink shade. I was trying to achieve a soft subtle background for the die images. I used a sponge and a sponge dauber on this background. Once the background I was finished I die cut all my images and adhered them to the card with a combination of glue dots and Ranger multi matte medium. I stamped my sentiment and scattered a few sequins for some additional background interest and that completed my card. Here is a close-up shot of the dies. I also used some white glitter paper for my snowbank and mailbox snow. Look at the cute little hedgie and also the letters in the mailbox. The white one even has a stamp on it- so cute. Well my friends, that's my post for this week. I hope my card has given you some ideas of ways to use this new die set. Just a reminder that our 6th challenge is going on with a Holiday theme this time around. Get info here. Oh my goodness, what a darling little scene! I've missed that die. How can I spend what feels like hours on the site, and still miss these gems? I love your card and the colors. Love the soft colors of the background and the cute die cut scene.